Fox News contributor, Washington Post columnist and neoconservative thought leader Charles Krauthammer has died of cancer, and there is a mad media rush of establishment eulogies scrambling to canonize him as a great man in the eyes of the public before anyone can step back and take stock of what this man’s legacy actually is. This is perfectly understandable, because if social consciousness cements into history what a wheelchair full of toxic human waste Krauthammer actually was, it will make things much more difficult for them to manufacture support for their neoconservative wars going forward. In April of 2003, Charles Krauthammer christened the Iraq invasion he had loudly and persistently advocated the “Three Week War”. As part of his arguments about how easy the war would be and how soon it would be over, the time-challenged Krauthammer bizarrely asserted that the war in Afghanistan had taken nine weeks. In October of 2003, after the Three Week War had been raging on for seven months, he penned an article for the Chicago Tribune titled “The problem with armchair pundits“, which was essentially one long whinge about all the criticisms the Bush administration had been receiving for its disastrous intervention. In February of 2004, after the Three Week War had been dragging on for nearly a year, Krauthammer received an Irving Kristol Award (essentially the exact opposite of what a Nobel Peace Prize is supposed to be), during which he gave an influential speech about the wonders of unipolarity, a popular term he coined that is now a popular term commonly used in reference to neoconservatism which describes America’s dominance over the world following the collapse of the Soviet Union. The speech laid out a framework for how the US government can best use its ability to to unilaterally effect change throughout the post-9/11 world. 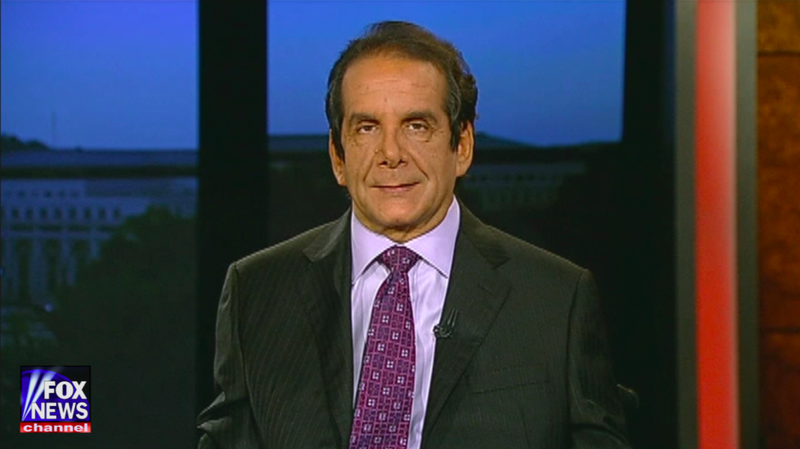 In May of 2006, after the Three Weeks War celebrated its three year anniversary, Krauthammer was named by the Financial Times as the single most influential commentator in all of the United States. He would go on to sell the lie that “Voices around the world, from Europe to America to Libya, are calling for U.S. intervention to help bring down Moammar Gaddafi,” and then to advocate regime change in Syria. On top of the terror, destabilization, and million deaths caused by the Iraq invasion, Krauthammer used his immense influence to help manufacture support for tens of thousands of dead Libyans and hundreds of thousands of dead Syrians caused by US interventionism in those nations. And still he remained gainfully employed. As Obama prepared to leave office toward the end of Krauthammer’s career, he excoriated the outgoing president for insufficient hawkishness and interventionism with Syria, Iran, Russia, and Iraq, all in the same article. One of his final Washington Post op-eds called for the US to re-place nuclear weapons in South Korea, leaving one to wonder if his cancer left him lucid enough to see the steadily progressing peace talks proving him wrong one last time. To the very end of his career, Charles Krauthammer was shoving the world as hard as he could toward death. He loved death. Now he has it. May all other neoconservative death cultists soon get their wish as well. In spite of overwhelming and repeated mountains of evidence to the contrary, Charles Krauthammer claimed to believe that wars were easy, expedient, and good. He spent decades promoting death and destruction in the name of this perverse ideology, and allowing the world to make a saint of him now would be paving the way for more Charles Krauthammers in the future. He was evil, he served evil, and it is good that he is now dead. Hopefully McCain, Kissinger and Cheney soon follow, with increasingly great disdain shown to their infernal legacies. The American supremacist vision of unipolarity Krauthammer based his worldview upon has led to entire nations being collapsed under the false pretenses of spreading freedom and democracy, when in reality they were first and foremost geared at preserving that very unipolarity as a goal in and of itself. US-led wars of aggression are about power and dominance; believing that the most powerful empire in the history of civilization isn’t driven primarily by a hunger for power is like believing that Jeff Bezos is uninterested in money or Kim Kardashian is uninterested in fame. This insatiable power hunger is what Krauthammer dedicated his life’s work to feeding, no matter how many lives it cost. And now he is gone. Finally. Good riddance. Let us remember him for what he was, and not for the fake image of him that the establishment war propagandists are scrambling to create. Charles Krauthammer is dead. May he rest in war. Amen.